We believe in secure work for all staff. On shaky ground: security in academia? 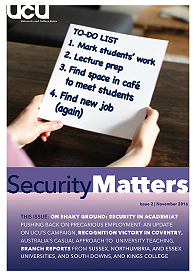 Issue 1 of 'Security Matters', the campaigning publication from UCU which looks at the issues facing precarious workers in post-secondary education.